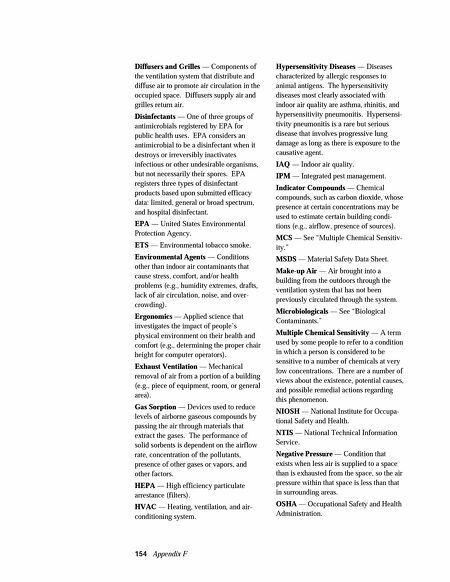 Glossary and Acronyms 153 ACGIH — American Conference of Governmental Industrial Hygienists. ASHRAE — American Society of Heating, Refrigerating, and Air-Condition- ing Engineers. ASTM — American Society for Testing and Materials. Air Cleaning — An IAQ control strategy to remove various airborne particulates and/or gases from the air. The three types of air cleaning most commonly used are particulate filtration, electrostatic precipita- tion, and gas sorption. Air Exchange Rate — Used in two ways: 1) the number of times that the outdoor air replaces the volume of air in a building per unit time, typically expressed as air changes per hour; 2) the number of times that the ventilation system replaces the air within a room or area within the building. Antimicrobial — Agent that kills micro- bial growth. See "disinfectant," "sani- tizer", and "sterilizer." BRI — See "Building-Related Illness." Biological Contaminants — Agents derived from or that are living organisms (e.g., viruses, bacteria, fungi, and mammal and bird antigens) that can be inhaled and can cause many types of health effects including allergic reactions, respiratory disorders, hypersensitivity diseases, and infectious diseases. Also referred to as "microbiologicals" or "microbials." Breathing Zone — Area of a room in which occupants breathe as they stand, sit, or lie down. 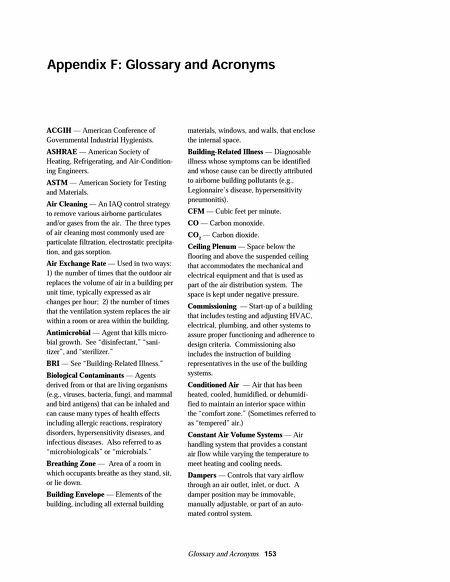 Building Envelope — Elements of the building, including all external building Appendix F: Glossary and Acronyms materials, windows, and walls, that enclose the internal space. Building-Related Illness — Diagnosable illness whose symptoms can be identified and whose cause can be directly attributed to airborne building pollutants (e.g., Legionnaire's disease, hypersensitivity pneumonitis). CFM — Cubic feet per minute. CO — Carbon monoxide. CO 2 — Carbon dioxide. Ceiling Plenum — Space below the flooring and above the suspended ceiling that accommodates the mechanical and electrical equipment and that is used as part of the air distribution system. The space is kept under negative pressure. Commissioning — Start-up of a building that includes testing and adjusting HVAC, electrical, plumbing, and other systems to assure proper functioning and adherence to design criteria. Commissioning also includes the instruction of building representatives in the use of the building systems. Conditioned Air — Air that has been heated, cooled, humidified, or dehumidi- fied to maintain an interior space within the "comfort zone." (Sometimes referred to as "tempered" air.) Constant Air Volume Systems — Air handling system that provides a constant air flow while varying the temperature to meet heating and cooling needs. Dampers — Controls that vary airflow through an air outlet, inlet, or duct. A damper position may be immovable, manually adjustable, or part of an auto- mated control system.